Bring a medium pot of water to a boil over medium-high heat. Add the potato pieces, once the water returns to a boil, cook for 10 to 12 minutes or until the potatoes are tender. Drain. Place the chorizo in a large skillet over medium-high heat. As it cooks, use a wooden spoon or spatula to crumble it into smaller pieces. Once it browns and crisps, 5 to 6 minutes, add the scallions and stir to combine; cook for about 1 minute or until the scallions begin to soften. Add the cooked potatoes and salt, mashing them into the chorizo mixture with a potato masher or a wooden spoon, for about 1 minute until well combined. Remove from the heat. Taste, add salt as needed. Heat a dry, medium skillet over medium heat. Warm the tortillas in the skillet one at a time for 15 to 30 seconds on each side, to soften them for rolling and so they will not crack as you assemble tacos. Place a few tablespoons of the filling on the center of each heated tortilla, and roll, as tightly as you can, into a taco. Insert a wooden toothpick through taco pairs, through the seams to help them retain their roll shape as they cook. When they have all been rolled, finish the tacos by either frying or toasting them. To fry the tacos: Pour enough oil into a large skillet to a depth of about 1 inch, place over medium heat. Once the oil is hot, 4 to 6 minutes, fry the tacos in batches, placing them in the skillet, without crowding them. They oil should be bubbling as they cook. Cook for about 2 to 3 minutes on the first side, until the bottom and sides have crisped and turned golden. Use tongs to turn over the tacos, cook for another 2 to 3 minutes. Transfer them to a plate lined with paper towels. Continue until all the tacos have been fried. To toast the tacos: Heat a large, dry skillet or comal over medium heat. Working in batches, place the tacos in the skillet. Let them toast and heat for about 3 to 4 minutes or until the tacos are browned and crisped, then flip to the other side and toast until evenly browned and crisp. Remove all toothpicks; serve warm. Have you ever had “Molotes” in Oaxaca, and if yes, do you have a recipe? Oh I don’t have a recipe right now…I’ll try to work on one soon, Bricia. How might you alter this recipe if all you have on Hand is cooked chorizo? You can follow it nearly exactly the same, Jasmine. Add the cooked chorizo to the pan and add the scallions and then follow the recipe as is. Thank you for this recipe! I grew up eating chorizo and egg tacos for breakfast but my sister is recently allergic to egg so this recipe pleases everyone in our family. These tacos are in regular brunch rotation in my family. Thank you Pati for this recipe. I made some today. Its very delicious. Rather than a dry heat skillet, I heat some oil in the skillet, dip the tortillas in briefly to soften them up. Then I place a few tablespoons of the filling in the center of each heated (with oil) tortilla, and roll tightly working quickly cause the tortilla is hot. Once rolled tightly I place the rolled taco (seam side down) in a square oven proof pan and heat about 15 to 20 minute each side. 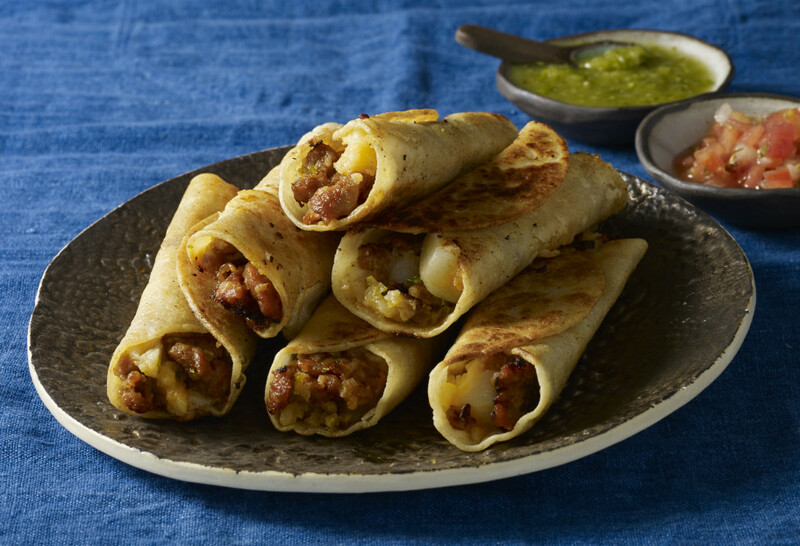 The oil in the tortilla really crisps up the tacos…no need for toothpicks. What temperature did you use?